Each of the Canary Islands (and their satellite isles) are very different in feel. Some people love one island, but hate another. Beauty really is in the eye of the beholder and your island experiences may be totally different to the experiences of another. Fuerteventura is part of seven islands in the archipelago making up the Canary Islands. They are situated in the Atlantic Ocean off the north-western coast of mainland Africa (Morocco and the Western Sahara). The Canary Islands, although technically coming under Spain and part of the EU, are autonomous with their own government and taxation systems. The Canary Islands are split into 2 different communities - the islands of La Palma, La Gomera, El Hierro, and Tenerife come under the legislation of Santa Cruz de Tenerife. The islands of Lanzarote, Fuerteventura and Gran Canaria fall under Las Palmas de Gran Canaria. Fuerteventura is the second largest Canary Island, 100 kilometres long by 31 kilometres at its widest, and is closest to the African coast. It is regarded as the oldest of the Canary Islands, and has the highest number of sand dunes and long sandy beaches of all the islands. Fuerteventura is relatively uncommercialised, retaining much of its unspoilt original beauty and calm with a landscape of contrasting volcanic contours, sandy beaches and rocky coves. It is the driest island, with little rainfall and over 3,000 hours of sunshine per year. If you are looking for a place to get-away-from-it-all, then Fuerteventura would be a good choice. La Oliva is the most northern, and includes the Corralejo resort area. Betancuria is situated in the centre and to the west side of Fuerteventura. Puerto del Rosario is located in the center of Fuerteventura. Antigua is about 2/3rds down and to the east side of Fuerteventura and includes Caleta de Fuste resort area. Tuineje is about 2/3rds down and stretches across both west and east coasts of Fuerteventura. 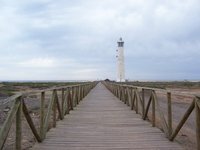 Pájara is the last 3rd and includes Costa Calma and Morro Jable resort areas. This area comes under "Jandia" and has some of the Canary's largest beaches, along the Sotovento beaches. The island of Fuerteventura enjoys a mild, dry climate with average daytime temperatures from around 21 °C in January to 29 °C in August. The weather is very similar to Florida and Mexico with over 3,000 hours of sunshine a year, making them your ideal choice as a holiday destination. Although only 9 kilometres apart, Fuerteventura's most northerly point Corralejo, is usually about 2 °C warmer than Playa Blanca, in the south of Lanzarote. Fuerteventura Airport (FUE) has flights arrive from most major destinations within Europe on a daily basis. Some of the airlines flying into this airport include Air Berlin, Air Europa, Condor Airlines, MyTravel Airways, Ryanair, Thomas Cook Airlines and TUIfly. The airport is situated just outside the islands capital of Puerto del Rosario, half way down the island on the east coast. Ferries connect all the Canary Islands and passenger liners regularly dock in Fuerteventura's main ferry port and capital city Puerto del Rosario. Fuerteventura is connected to Lanzarote from Corralejo in the north, which is served by regular daily ferries. Several pleasure cruises also sail between the 2 islands from Corralejo, either docking at Playa Blanca in the south, Puerto del Carmen, or Arrecife, Lanzarote's capital. From Corralejo there are also daily ferries to Isla de Lobos which is just 2 kilometres away - ideal for day trips. Puerto del Rosario's ferries travel to all the other Canary Islands, as well as the new service to Morocco. Morro Jable in the south of Fuerteventura is served by ferries to Gran Canaria. Car hire is fairly cheap on the island, with several different companies to choose from. There really is no need to book before you leave unless you are travelling at peak times. Please remember that drivers must possess a full licence and be over 25 years of age to hire a car in any of the Canary Islands. The main roads on Fuerteventura are good, but there are several unmade roads, for example Cofete in the south of the island, so it may be worth considering a 4-wheel drive model. Most hire companies are aware of the condition of the roads and accept that their cars will inevitably be taken "off road" although there are terms in their hire agreements which forbid this use. Another term in their contracts is that their cars cannot be taken to another island - Fuerteventura to Lanzarote, although this regularly takes place without penalties! If in doubt, ask! A word of warning: Fuerteventura has only recently introduced traffic lights. Roundabouts are also a fairly new phenomenon which the older generation of Spanish drivers seem to find completely baffling! Most cars travel round in the outside lane, no matter which exit they are taking - be careful as you may well find cars cutting across your exit route! A bus in the Canaries is called a "guagua" (pronounced: waa-waa). Local buses are run by Tiadhe and connect most of the villages throughout the island, albeit some routes may not be as frequently served or regular as others! Fares are cheap and "season tickets" can be purchased, so make sure to ask for them to get your discounted rate. Depending on the resort you have booked with, it may be able to get a free bus to your chosen destination - check this out with your hotel or tour company. See section above for commercial ferry details. There are several pleasure cruises and tours available from all tourist resorts. Like other Canary Islands, Fuerteventura has adopted the Euro (ISO code: EUR, symbol: €) as its official currency. One Euro is divided into 100 (euro)cents, which are sometimes referred to as eurocents, especially when distinguishing them from the US cents. Euro banknotes come in denominations of €5, €10, €20, €50, €100, €200 and €500. The highest three denominations are rarely used in everyday transactions. All Euro banknotes have a common design for each denomination on both sides throughout the Eurozone. The Euro coins are 1 cent, 2 cents, 5 cents, 10 cents, 20 cents, 50 cents, €1 and €2. Some countries in the Eurozone have laws which require cash transactions to be rounded to the nearest 5 cents. All Euro coins have a common design on the denomination (value) side, while the opposite side may have a different image from one country to another. Although the image side may be different, all Euro coins remain legal tender throughout the Eurozone. The €1 and €2 coins issued in Spain have the portrait of King Juan Carlos on the image side, the 10, 20 and 50 eurocent coins depict the famous writer Cervantes, the 1, 2 and 5 eurocent coins carry the image on the Cathedral of Santiago de Compostela. There are also €2 coins, to commemorate the Treaty of Rome, and the celebration of 400 years since the publishing of the story of Don Quixote in 1605, which depicts Don Quixote on the coin. Banks and bureau de change are found throughout the island, with most speaking English. Goods purchased within the islands are duty free, but are limited to specific personal allowances - check your country's regulations. Spanish is the native language, but with a distinctive Canarian twist! True Spanish as spoken in the peninsula pronounces the letter "s" as a "th". People from South America pronounce the "s" as an "s", but the Canarians sometimes don't pronounce it at all - it becomes a silent letter, which can make the word sound completely alien and unrecognisable. Example "Dos cañas" (2 beers), becomes "Do caña". The good thing is, whatever style of Spanish you speak, you will be understood by the Canarians - but you may not understand their replies! English is widely spoken in the resort areas, as is German and Italian. Most people appreciate the fact that you try to speak their language, even if you get it wrong, so have a go and add a new dimension to your holiday! There are many good international restaurants throughout the island, and there are also some fast-food names which you will recognise. Locally caught fish is abundant and delicious and definitely has to be tried. Most of the small bars in even the remotest parts of the island will serve food of some sort where you can receive a true taste of Canarian cooking. Your choice of where to stay is just as varied as anywhere else in the world. There are many hotels with different star ratings, throughout the island. Property rentals are abundant and varied and suit all budgets. There are a few "casas rural" - small countryside hotels located outside the main resort areas which are a good option for those wanting to get away from it all. Spanish culture includes drinking, but as people live with it from cradle to grave, there are not the same problems with alcohol abuse and hooliganism as other parts of the world. In truth, any trouble say, outside a nightclub in the early hours of the morning, is usually caused by rowdy holiday makers. Fuerteventura does not produce its own wines etc, so all alcohol is imported. However, Spanish wines are still cheap and varied, and most international wines and spirits are readily available from local supermarkets. If you intend buying alcohol to take home as duty free, your cheapest option is to buy from a supermarket, not from the airport where the prices are generally higher. There are health centres and dentists in the main resort areas, with the main hospital being in the capital Puerto del Rosario. Common sense prevails - don't go out alone late at night in any of the barrios (housing estates) in Puerto del Rosario. Keep all valuables safe and be sure to close windows and lock doors when leaving your apartment, even for a short time as most theft is opportunistic. Sunscreen is a must. Fuerteventura benefits from a breeze all year which can feel cool in the winter, but lovely in the summer - don't be fooled - you are still being pounded by UV-rays even though you feel totally comfortable! If you do need an aftersun treatment, Fuerteventura produces aloe vera plants and manufactures various products to help with skin irritation of all sorts. Bottled water should be used for drinking although tap water is perfectly safe for cooking or using to boil for tea or coffee. Internet cafes are everywhere so you can always pick up your emails or stay in touch with the outside world! You can obtain cheap phone cards everywhere. The dialling code into Fuerteventura is the same as the rest of Spain (Country code: ++34). Post offices are generally open from 8:30am to 2:00pm, although times can vary and the main post office usually is open until the early evening. Most will also open again on Saturday mornings, but in the smaller towns will close as early as 12 noon. When posting a letter, look for a yellow box and, if possible, post at the post office itself where there will also be divisions for local, national and international mail. Be prepared for long queues at the post office. This is why tobacco shops sell stamps and many will also have the facility to weigh packages. Standard letters/postcards of up to 20 grams sent within Spain are €0.34. However, non-standard letters/postcards of up to 20g are €0.39. Letters/postcards of 20 to 50 grams are €0.45. In the case of international shipping, the price is €0.64 to most countries within Europe for standard envelopes (letters/postcards) up to 20g, for a few European countries and outside Europe it is €0.78. We have a comprehensive list of accommodation in Fuerteventura searchable right here on Travellerspoint. You can use our map to quickly compare budget, mid-range or top of the range accommodation in Fuerteventura and areas nearby. This is version 49. Last edited at 3:15 on Aug 2, 17 by sleepBot. 22 articles link to this page.